Dr. Nicholas Nguyen, director of pediatric dermatology at Akron Children’s Hospital, discusses the dangers of tanning beds – and how teens are particularly vulnerable. Q: It looks like tanning bed use by teens is on the decline, according to the latest youth survey by the U.S. Centers for Disease Control and Prevention. Still, usage is high among white teenage girls and young women. What harms have you seen from indoor tanning? A: Indoor tanning tops the list of “worst things you can do to your skin.” Its effects on the skin are absolutely devastating. Ultraviolet radiation from indoor tanning is a known carcinogen and is associated with a markedly increased risk for developing potentially fatal skin cancers including malignant melanoma, squamous cell carcinoma and basal cell carcinoma. Radiation from indoor tanning also accelerates skin aging. People who tan may do so in order to improve their appearance. Ironically, tanning has the opposite effect. People who tan develop wrinkles, sagging or drooping skin, leathery skin and uneven tone at a much earlier age. Unfortunately, the majority of these changes are irreversible. Q: Most states have some type of restrictions on minors using commercial tanning salons. Many prohibit anyone under 18; Ohio only requires teens under 18 to bring a parent to sign a consent form. What makes tanning beds more hazardous than outdoor tanning? A: Just like cigarette smoke, ultraviolet radiation from indoor tanning is a known carcinogen (cancer-causing agent). Recognizing these risks, the U.S Food and Drug Administration (FDA) has issued strong recommendations against the use of tanning beds, particularly for minors under 18. Many states have heeded these recommendations and banned tanning for minors. It is my hope that our state will follow suit. Q: Are teens particularly vulnerable? A: Absolutely. Teens feel a tremendous amount of pressure to appear attractive. Many teens feel more attractive when their skin is tan. Other teens feel invincible. They have heard tanning can increase risk for skin cancer, but they do not believe it will actually happen to them. Other teens want to be rebellious. Just like smoking, they know tanning is harmful and that is exactly why they do it. Unfortunately, teens are more vulnerable to the dangers of indoor tanning. Melanoma is the second most common cancer in females age 15-29, and early exposure to indoor tanning significantly increases melanoma risk. Tanning is also addictive for many teens. Some start tanning for prom and become hooked. Q: So the idea that getting a base tan at a salon protects the skin from sun damage outdoors is a myth? A: This is a common misconception, even among healthcare providers. Achieving the base tan itself is arguably more harmful than the subsequent outdoor exposure. Even one indoor tanning session can increase risk for skin cancer. In one study, the risk for squamous cell carcinoma increased 67 percent after just one session in the tanning bed. 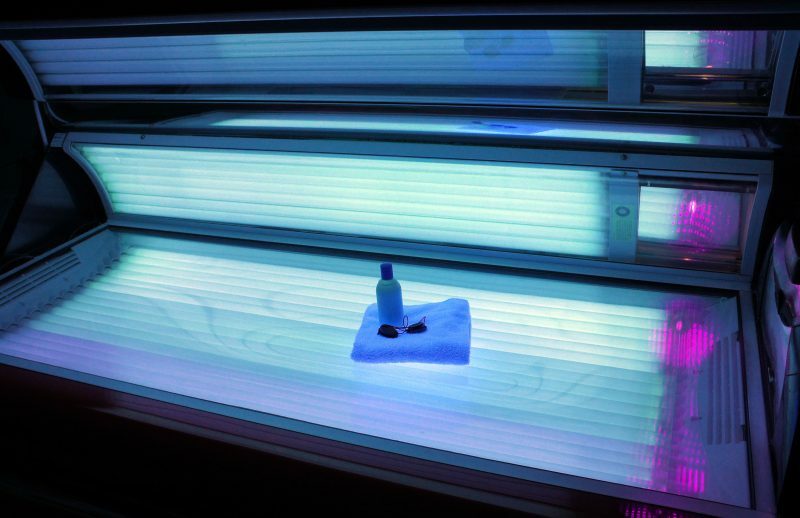 Even people who do not burn increase their risk for melanoma if they tan indoors. Q: Skin cancers in women under 40 have increased sharply in recent decades. Are tanning beds to blame? A: The increased incidence is probably multifactorial, but there is no doubt that ultraviolet radiation from indoor tanning is a major contributing factor. A large proportion of young women whom I have personally diagnosed with skin cancer have a history of tanning bed use. Some studies have estimated that indoor tanning accounts for 400,000 cases of skin cancer in the U.S each year. Q: Is there a safe amount of tanning? A: The term “safe tanning’” is a misnomer. The skin tans in response to damage from ultraviolet radiation. After this damage occurs, the skin attempts to protect itself by increasing the amount of pigment in the skin. As mentioned above, even one indoor tanning session can increase risk for skin cancer. Natural sunlight also contains harmful UV rays, even on cloudy or rainy days. These rays are most intense between the hours of 10 a.m. and 4 p.m. Avoiding times of peak exposure is very important. UV radiation can penetrate window glass and so it is important to protect oneself at the office, in the car or at home. Q: If you must be tan, is a spray-on tan the safest bet? A: I always recommend maximizing one’s natural glow with moisturizer and sun protection. Having said that, if a patient feels strongly about appearing tan, I do recommend self-tanners over indoor or outdoor UV radiation.